Be the first to share your favorite memory, photo or story of Bettie . This memorial page is dedicated for family, friends and future generations to celebrate the life of their loved one. 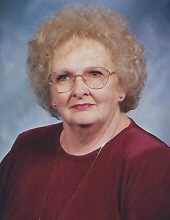 Mrs. Bettie Lou Judd of Greensburg, Kentucky, daughter of the late James Lucas Judd and Ada Mildred Adkins Judd, was born on Monday, September 2, 1940 in Green County and departed this life on Thursday, November 8, 2018 at her home. She was 78 years, 2 months, and 6 days of age. She had made a profession of faith in Christ, was a member of the Ladies Chapel United Methodist Church and was a homemaker. She united in marriage to Hugh Linwood Judd on January 1, 1955 who preceded her in death on January 12, 2012. Survivors include two sons and daughters-in-law: Jim and Dana Judd of Green County, and Tim and Dina Judd of Paris, Kentucky; four grandchildren: Sara and Chris Wright, Tiffany and Jonathan Meadows, Michael and Joy Young all of Green County, and Samantha and Jordan Fain of Winchester; three great-grandchildren: Abrie Meadows, Liam Meadows, and Dalton Young all of Green County; three sisters-in-law and a brother-in-law: Maurine Whitlow of Greensburg, Cleo Judd of Columbia, Adeline Judd of Glasgow, and Curtis Judd of Campbellsville; and a host of nieces, nephews, other relatives and friends. Mrs. Judd was also preceded in death by a great-grandson: Braiden Lukas Meadows on October 9, 2006. The funeral services for Mrs. Bettie Lou Judd will be conducted at 10:00 A.M., Central Time, Monday, November 12, 2018 at the Cowherd and Parrott Funeral Home with burial to follow in the Ladies Chapel Cemetery. Bro. Garnett Wayne Davis and Bro. Jonathan Meadows officiating. Visitation is requested from 3 P.M. until 8 P.M., Central Time, Sunday at the Cowherd and Parrott Funeral Home and after 7 A.M., Monday until time of the funeral service. To plant a tree in memory of Bettie Lou Judd, please visit our Tribute Store. "Email Address" would like to share the life celebration of Bettie Lou Judd. Click on the "link" to go to share a favorite memory or leave a condolence message for the family.